-Amphoteric chrome oxide is the only stable oxide of chromium metal and can be used at all temperatures to 1200C. This leaves a margin before it begins to volatilize around 1240C, the fumes are very toxic. -Chromium is a 'fast' color, meaning it produces its characteristic green in slow or fast and oxidizing or reducing firing. It is also used in paints and dyes. The green color produced by chrome only is generally a drab army-helmet green. -Chromium is not very soluble in glass and does not form silicates or combine with fluxes readily unless compounds are finely ground (e.g. ball milled) and dispersed and amounts are not excessive (1% will dissolve in most glazes and give good color, but amounts above that are increasingly likely to opacify the glass rather than color it more, this is happening because it is not dissolving in the melt). Amounts up to 3% in a glaze recipe gives greyish green coloration. -Zircon opacifier 1-2% is often added to chrome glazes to stabilize them and prevent brown edges. -Because chrome reacts with normally inert tin to produce chrome-tin pink colors, calcium carbonate and alumina are usually used instead of tin to lighten and clarify chrome green glazes. -Chromium oxide is added to enamels for green where borax and zinc are used to increase the brilliance of the color. However, chrome in ground coat enamels tends to react with the metal to cause blistering. Chrome-tin pinks move toward purple in glazes with significant boron. One glaze with 3.3 SiO2, 0.27 Al2O3, 0.2 B2O3, 0.15 Li2O, 0.5 CaO, 0.1 MgO, 0.15 Na2O employed 5% tin oxide, 0.6% cobalt carbonate, 0.17% chrome oxide to produce a good purple at cone 6. 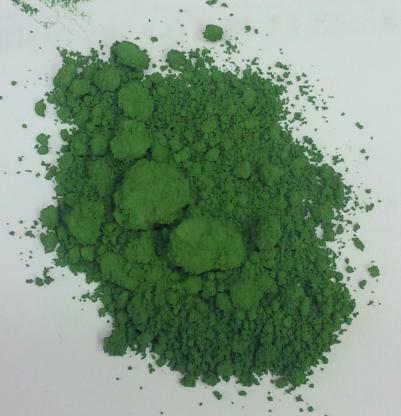 Chrome is a classic green colorant for recipes in oxidation and reduction at all temperatures. However, the shades it produces can be opaque, dull, and uninteresting. In the presence of CaO, the color moves toward grass green. Drab chrome greens can be moved toward peacock green with the addition of cobalt oxide (1% each gives bright color, some MgO needed also). This works in zinc free boron and soda glazes. Chrome in zinc glazes tends to form the stable crystalline compound, zinc chromate (ZnCr2O4). which is brown. Chrome is a constituent in almost all black oxidation colors. It is used up to 40% in Cr-Co-Fe blacks and as high as 65% in Cu-Cr blacks. Chrome and tin are a widely used combination to produce pinks in zinc free glazes with at least 10% CaO and low MgO (alkaline glazes work well). 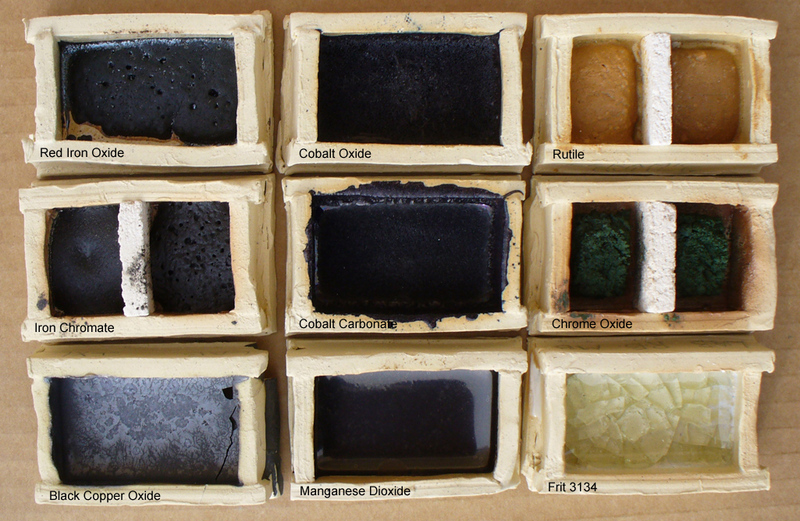 Many stains are based on this system and typically have around 20-30 times as much tin oxide as chrome oxide. Tin would typically be around 4-5%. Below 950C in high lead, low alumina glazes, chrome will produce reds to ranges, often with a crystalline surface. The addition of soda will move the color toward yellow. Chrome in high lead glazes forms yellow lead chromate. Alkalies are recommended in the base glaze. Added zinc can extend the range to orange. In ceramics color is often a matter of chemistry, that is, the host glaze must be compatible and have a sympathetic chemistry for the stain being added. Chrome-tin stains are a classic example.